Early in the morning I left from Mina's house in Thessaloniki to be at 6:00 at the Macedonia airport. Aegean's flight was at time (8:00) and Eleni was waiting me at the Munich's airport. We did shopping and I prepare my staff for the mountain. At 5 o'clock in the morning I took the U2 metro in Hohenzollernplatz, from where i went to Munich Main Station (Hauptbahnhof). The train to Garmich-Partenkirchen departs at 6:30 and we reach our destination at 8:05. Garmisch is a very beautiful city. 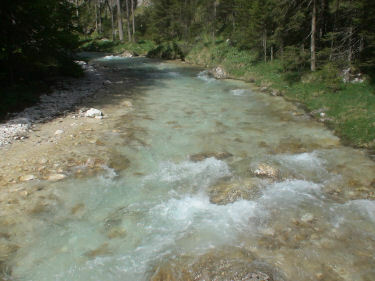 I walk for while into Garmisch until to reach the path which is guiding to Reintral gorge. I follow the path (at the begging was thin road), which is path through the dark very impressive Reintal gorge. After an hour the path is entering to Reintal valley and I arrive at Bockhutte (node point). I trek continuously and I reach Reintalangerhutte where I stop only for a few minutes. The path after the hut it was not so good and passes through the old glacier moraine. The path starts to be steeper, while over 1700 m altitude everything was covered by snow, which was melting due to the very warm sunny day. It was quite tired to reach Knorrhutte located on 2054 meters quite closed to the summit Zugspitze. The people in Knorrhutte was very friendly and helpful, while the hut was very clear and offering various meals and type of beers. I spend the afternoon speaking with the Nepali young guide who was working in the hut at the summer time. The people of the hut give me useful info in order to find out the path to the summit and the dangerous points of the route. At 7o'clock I start for Knorrhutte and trek to ski tracks where i reach them after half an hour. I follow the ski tracks up to Sonn Alpin located in Zugspitzeplatt. From here Zugspitze is visible on the right side and the route was quite difficult through Schneefernerhaus, where it was about 40 degrees steep. The wire rope of via-ferrata was covered by snow and I could not recognize the route. After Schneefernerhaus the route has a traverse where it was avalanche dangers. Snow condition was too bad due to very hot days. Finally i reach the west ridge (German-Austrian borders). The ridge is quite long and was partly covered by snow. Almost on the summit there is the Munchener Haus 2921m, where many people are coming by cable car. 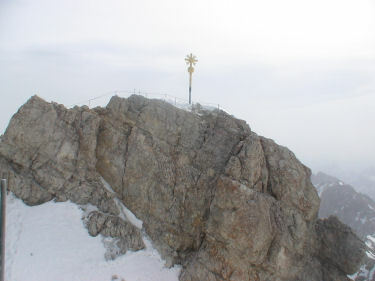 From here, a steep vertical rock leads to to the highest summit of Germany Zugspitze with 2962 altitude. From Zugspitze I enjoy the beautiful view and I return to Munchener Haus where many tourists arrive with cable car. The descent from the same route was much easier and faster and at 12:30 I was back to Knorrhutte. Even though, I had time to go back to Munchen, I decide to spend one more night in Knorrhutte. It was dark when I wake up, and with the first light (5:00) I was on the path. After an hour I pas from Reintalangerhutte and at 7:00 I reach Bockhutte where I did a long break for rest. From here I took the path No 835 which is guiding to Stuibenhutte. I ascent about 500 meters higher and I found a small path which was descent and passing from the very nice Diensthutte where drinkble water is available. Following the main path and the small roads through the green fields I was back to Garmisch at 11:20. By train was back to Munchen at 14:10 where I had a long rest afternoon. Using the bike of Eleni's father I am biking near to Isar river and after northwest to Olympic village. Totally, I did 35 kilometers inside Munchen. At the afternoon we had lunch at the backyard of Eleni's house. The wedding's preparations begins early at the morning and at 16:30 the limousine pick Eleni's family to the Church. It was very nice orthodox wedding. From the church we move to Putzbrun a neighborhood of Munchen where the party starts at night. We enjoying dancing until the morning. Matina, sister of Eleni drive us to Dachau where we visit the accumulation camp. We did a walk around the city and the night we drink beers in Clemens' bar. At the morning i bike northwest to the two small lakes in the neighborhood of Munchen. After biking northeast a cross the ring road and finally return to Marienplatz in the center of Munchen. At the afternoon Eleni move us to airport where with Sofia (Eleni's cousin) flight back to Greece. A few time stop in Thessaloniki and at I night drive to Elati.